Background: Virtual reality laparoscopic simulators have proven effective for the acquisition and transfer of laparoscopic skill and offer the advantages of automatically recording participant performance, providing feedback, and minimizing the need for instructor involvement. Such simulators offer multiple performance metrics but their importance for proficiency-based training is poorly understood. 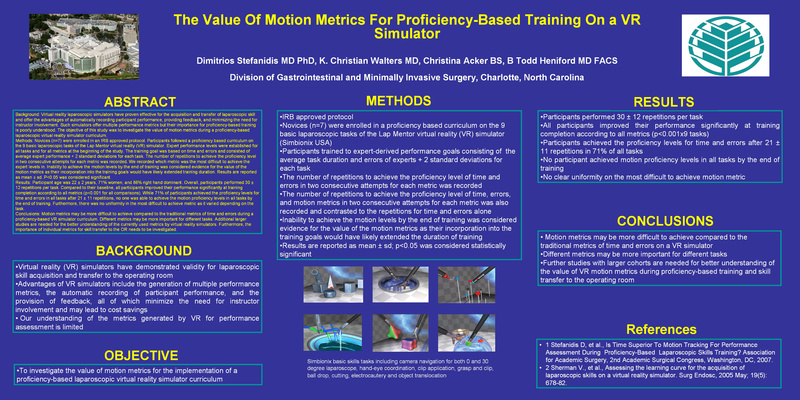 The objective of this study was to investigate the value of motion metrics during a proficiency-based laparoscopic virtual reality simulator curriculum.